A Baby's Best Start, breastpumps, breastfeeding information, breastfeeding stories, lactation insights, and more. Planning is essential to the breast-feeding mom who returns to work. First, you must establish your milk supply with frequent feedings. 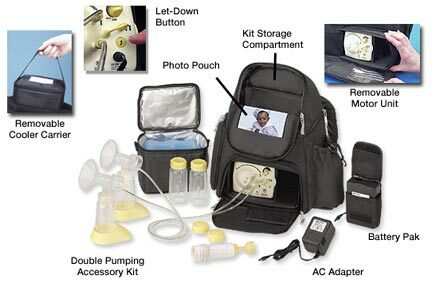 Next begin stockpiling your milk, using a high-quality electric breastpump, which will also help establish your supply. Now it is time to introduce the baby to the bottle, so she can feed during the day while you are gone. Begin pumping two to three weeks before returning to work. Simulate the pumping schedule you will have once your return to work. Enlightened companies may provide pumping areas, where you can use your portable breastpump. For more detail see Working without Weaning. Studies show differences of 5 to 10 IQ points between children breast-fed as babies and children who were formula-fed. The Mortensen study cited below compared a variety of studies on intelligence, adjusting for the effects of other possible factors such as parents’ level of education, mothers’ smoking, and infant birth weight. Recent discoveries about docosohexanoic acid (DHA) and arachidonic acid (AA), both of which occur naturally in human milk, and the role they play in the development of the infant’s brain provide clues to one possible cause of this difference. Mortensen, E.L., et al. The association between duration of breastfeeding and adult intelligence. JAMA 2002; 28(15): 2365-71. Xiang, M. et al. Long chain polyunsat-urated fatty acids in human milk and brain growth during early infancy. Acta Paediatr 2000; 89(2): 142-47.